Perfection is implementing, completing. It’s reaching for the sky and getting there. In overcoming perfectionism, the first step is realizing it’s a strength not a problem. The Five Factor Model of personality typing would say perfectionists have heavy doses of conscientiousness, well serving jobs requiring meticulousness, self-discipline and dependability. 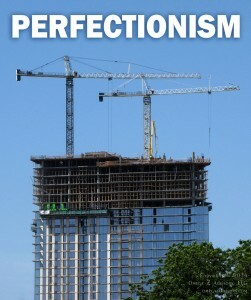 The second step is realizing any strength can be a weakness, perfectionism is not alone. Aggressiveness becomes impatience, determination becomes stubbornness, and rationality becomes insensitivity. This leads to the third step: use strength to overcome weakness by using it wisely. A gift mindlessly given to all is no longer a gift. Fifth, employ the most perfect, enduring and effective learning process in human history: trial and err. Trial means test. In other words, no doing, no mistakes, no learning, how perfect is that? Finally, realize school does not reflect life. “Do overs” exist, and contain huge money especially if labeled “new.” Software companies are notorious for getting us to “upgrade” to do-over software because they left out vital features in prior versions. So, as for today, make a dozen mistakes, learn from them and have a perfect day. Two great points you make: (1) “A gift mindlessly given to all is no longer a gift.” And (2) “… no doing, no mistakes, no learning …” Perfection, used correctly, provides targets; over emphasized, causes paralysis!!! Thank you, John. Someone on my distribution list emailed me to say she liked the gift sentence too. Your point about perfection summarizes my post well. Any strength becomes a weakness at some point and under the right conditions, not just perfection. Perfection as a weakness very often creates paralysis. Thank you for visiting once again, John. I appreciate it. One trick I used was to tell myself that my worst was better than anyone else’s best. Not necessarily true but it got me through school. Yes, Walter, it is a trick and not necessarily true, but other times, and I suspect many times, it was a tool that was true. It’s really about mentally positioning yourself to overcome perfectionism or to prevent incompletion. Thank you for visiting and commenting. Ironic maybe but on my list for this morning is review of this TED Talk: “Each of us is more than the worst thing we’ve ever done.” on.ted.com/d0ELj For sure, I believe this to be true!!! That is definitely true, John. It’s good TED finally got around to that. The concept has been around for a long time and has been true for even longer!